(File Photo) BTS A skytrain is put though a test run on the Green Line’s Onnut to Baring extension ahead of its opening last year. Prayut’s use of his authority under Article 44 of the interim constitution also included an order for the establishment of a committee that would cut through wrangling over the fares to be charged on the Green Line and its extensions. The action requires that negotiations with the Green Line concessionaire, Bangkok Mass Transit System (BTSC), must be finalised within 30 days. The Green line extensions cover Baring-Samut Prakan and Mo Chit-Saphan Mai-Ku Kot. According to the website of the Royal Gazette, the order by Prayut, as chief of the National Council for Peace and Order (NCPO), requires the BMA to hire a private enterprise to install the electric system to get the extensions up and running quickly in order to ease traffic problems. The hiring arrangement would not come under a public-private partnership (PPP) scheme. To ensure that the Green Line and its extensions are run as the same network, a committee must be established by Ministry of Interior and will be chaired by the Interior Ministry’s permanent-secretary and include the Finance Ministry’s permanent-secretary, the Budget Bureau’s director-general, the secretary-general of the Council of State, the secretary-general of the National Economic and Social Development Board, the attorney-general, and the director-general of State Enterprise Policy Office as well as experts in finance and electric train systems. The committee will define the benefit-sharing criteria and other criteria for a combination of the Green Line extensions of Saphan Taksin-Bang Wa and Onnut-Baring, as well as the extensions of Baring-Samut Prakan and Mo Chit-Saphan Mai-Ku Kot, while finalising the negotiations with Green Line concessionaire BTSC, a subsidiary of BTS Group Holdings. The 30 days applies from the date of the appointment of the committee. Once the negotiations are completed, the contract adjustments must be finalised within 30 days of the amended contract being forwarded to the interior minister, the Office of Attorney General and the Cabinet, respectively. Anat Arpapirom, an adviser to BTSC, which operates the BTS skytrain, said had earlier said the company has been engaged in continuous negotiations with the BMA over the fares to be charged, but that the BMA has not yet given it detailed information. Separately, Worawut Mala, acting governor of the State Railway of Thailand (SRT), said that the PPP committee and a CP Group-led consortium have been negotiating the detailed wording for a contract underpinning a high-speed rail project that will connect Thailand’s three main airports - Don Mueang International in Bangkok, Suvarnabhumi International in Samut Prakan and U-Tapao in Rayong. The drafting of the contract is expected to be completed after the Songkran holiday. The PPP committee’s members will convene again to check the draft contract before it is forwarded to the attorney-general. A contract signing is expected in May. “Now, there are no talks about 12 proposals as those are outside the request for proposal (RFP) that have been already negotiated,” Worawut said. In other infrastructure developments, Somjin Piluek, governor of the Industrial Estate Authority of Thailand (IEAT), said that the PPP committee is negotiating with the only bidder for the third phase (Part 1) of the Map Ta Phut Port project, the Gulf and PTT Tank Joint Venture. The joint venture consists of Gulf Energy Development Plc and PTT Tank Terminal Co Ltd. The winner is expected to be announced this month, with the contract signing likely in June, he said. On February 15, the Gulf and PTT Tank Joint Venture submitted its bid, including technical and price proposals, for the project. The project’s development consists of two phases worth a total of Bt55.4 billion. The first part involves infrastructure development with the 200-rai, Bt47.9-billion port area. The IEAT will need to invest no more than Bt12.9 billion and the private consortium about Bt35 billion. The second part will relate to the port and the IEAT will announce the bidding for development by a private enterprise, which will develop a terminal for liquid products with a capacity of about 4 million tonnes a year. The construction is estimated to begin in 2023 and services to start by 2025, with an estimated investment of Bt4.3 billion. The country is in limbo - there is no government in place, yet, the self appointed PM is waving his big stick, S44, as if he had the right to do so. nonsense ..... The country is moving ahead as usual, this is evident everywhere you go as there is infrustructure being built. Unless yo get around with your eyes closed. Well done Khun Prayut Chan O Cha ..... you continue the good work to ensure things keep moving forward, this is a prime example of your keen desire to see Thailand develop. Can he use S44 to get the BTS to order more carriages? That would please a lot of people. More like he is getting as many kick backs finalised before any checks and balances are implemented by the new "legitimate" government !!! Perhaps he should be utilizing his remaining time in preparing for his future..... where he will have much more time to 'spend with his family'...... unless the democratically elected government overturn his 'self awarded amnesty' whereupon he will only be seeing his family 'during visiting hours'. Yes. Very similar to Germany 1941. Eyes are open. Compare Thailand to most of Asia, Thailand moves forward at a snails pace, if you call that moving ahead. You constantly show your love for military strong men who, unlike you, are afraid to engage in debate. If you were every Thai I know, I would say you deserve what you get. The truth is Thailand has had peace for decades and infrastructure that is just above that of countries that have been ripped apart by war and genocide. Why don't you show love for rule of law, debate and transparency instead of GQ style demagoguery. S44 is just a way for tourists to by travel insurance. Thailand is under military law and it is disgrace given the number of years of peace. I'm sure you understand Prayut's need for Article 44 which is to bypass transparency and accountability, the checks and balances required by laws and regulations to assure no government collusion and corruption in award of government funded projects. But I do admit Prayut ensures "things" keep moving forward - it's just that these "things" would not otherwise survive public scrutiny. 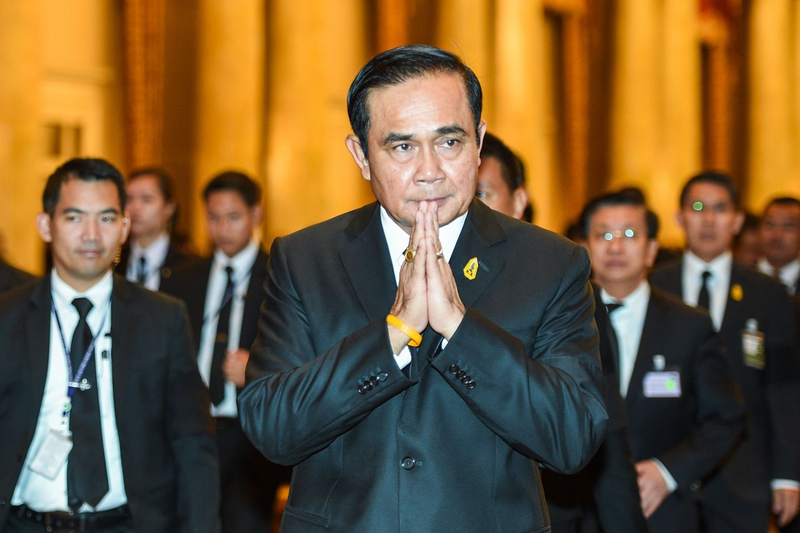 In five years as PM Prayut has never moved Thailand forward towards democracy. To the minority elite in power, that's a good thing. If a big stick is needed to hack through the unholy mess resulting from privatisation of public transport, yes, that is a good thing. If people are confused by the type of government of the day, maybe try to see why sometimes a big stick is needed. And I guess you also see the sometimes silly delays in very necessary projects because of private companies bickering about anything or officials bickering about everything? A government, in Thailand and elsewhere, is not elected, persons and parties are elected and tend to form a government. And then are doing what they want to do which mostly is far away from what the voters wanted. Democracy has been degraded to a voting circus without any real benefits to the people in general. ......the company has been engaged in continuous negotiations with the BMA over the fares to be charged, but that the BMA has not yet given it detailed information. Still squabbling and can't decide on the price of fares for the already built new BTS routes yet in the blink of an eye they can set the price of fares for the planned high speed trains which won't be operational for at least another 50 years. I shake my head in amazement and disbelief at the incompetence. Just wondering, do all future PM's get their own S44 magic wand of just PM Prayut?